The Rev. Mary Vano was called as the rector of St. Margaret's in June 2011. Originally from Harlingen, Texas, Mary received a Bachelor of Arts degree from Texas Christian University. 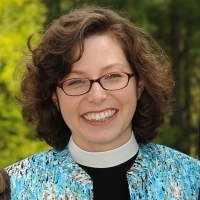 Later, she received a Master of Divinity at the Episcopal Theological Seminary of the Southwest in Austin, Texas. Ordained in 2003, Mary served as Associate Rector of St. David's, Austin before coming to St. Margaret's. Mary is married to Stephen Vano, and together they have two sons, Drew, and Matthew.